Karen Mayes is a paediatric physiotherapist based in North Yorkshire and a mum-of-two. 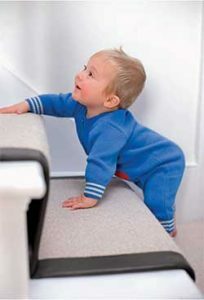 The earliest a baby will start moving out of the crawling stage and begin trying to pull himself up is at around eight months old. 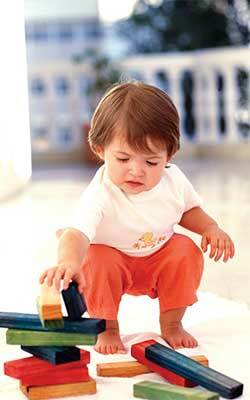 But some babies don’t feel the need to get up on their feet until 18 months old. That’s a difference of 10 months—which can feel very frustrating if your little one is still lounging around on the living room carpet while your best friend’s tot is trotting here, there and everywhere. But once you know just how many skills your baby has to master before he can move from crawling to walking, it’s much easier to relax and simply enjoy supporting him as he goes on his own, personal, walking journey. “And you’ll be amazed at how many skills he needs to develop before he’s ready to wobble across the floor on two feet,” says Karen. 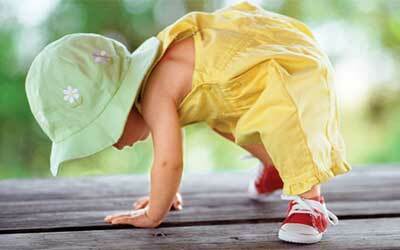 Those skills started developing from the moment your baby was born. You might think your newborn spent most of his time snoozing and feeding, but every movement he made was building up his neck and back muscles, so he gained enough strength to hold his head up against the pull of gravity. “Gaining that head control was the very first step your baby took along the road to walking,” says Karen. “In the months that followed, he’s been busy building up muscle strength, spatial awareness and co-ordination— all skills that he’ll need to walk. 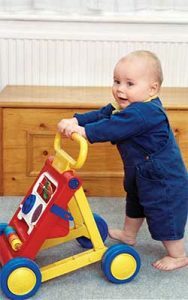 Any time he had to move freely, unconstrained by being in a pushchair or car seat, was time he could use to develop the muscles and body awareness he needs to move towards walking.” And even then, when he’s gathered all the skills he needs, going from simply standing up on two feet to moving them in a balanced and coordinated way so that he can stay upright on them, is no mean feat. So, over the next pages, you’ll find your guide to a baby-eye view of mastering the tricky art of walking. 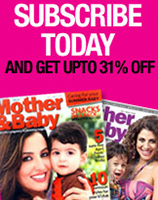 Get ready to cheer your youngster on his way to becoming a fully fl edged toddler! Your baby—who has so far spent most of his life in a horizontal position—is now vertical and this literally changes his view of the world. He now has to learn to use his body in a totally new way in that position, so it’s no wonder that it can take a while to build the confi dence to try! “Moving from standing to taking small steps along while hanging onto the sofa—or you!—is about confi dence as well as strength and balance,” says Karen. 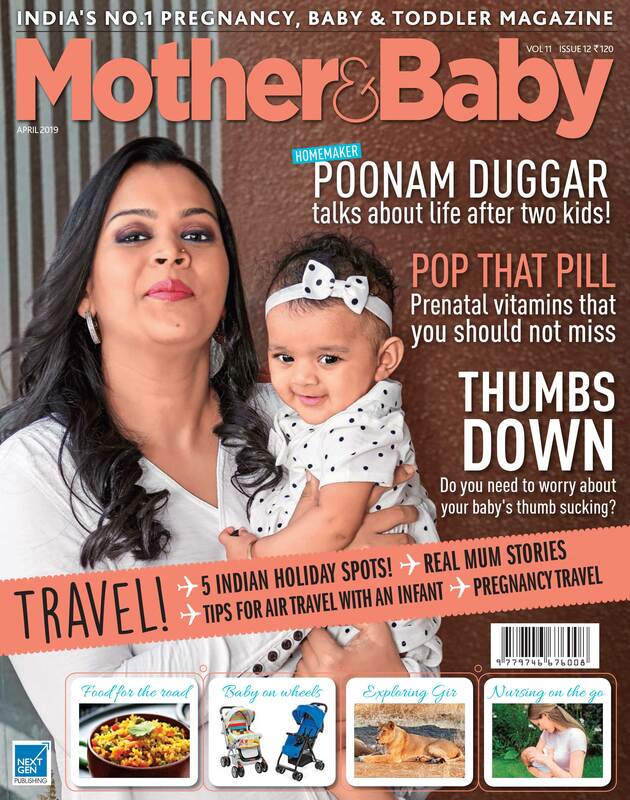 “Your baby has to work out that he needs to lift his foot, shift his weight, swing his foot forwards, put it down, transfer his weight onto it and then lift the other foot and balance his body on the other side. That’s a lot of skills and it’s a big move for a tiny person.” So make sure that he has plenty of time to practise, encourage his efforts and help him manage the frustration that’s part and parcel of learning a new skill. Give him time and encouragement and he’ll get there! To move from cruising to walking, he needs to build his confidence, his co-ordination and his strength that little bit more. He also needs to improve his spatial awareness so he knows where his body is in relation to all the other things in the room that might trip him up. And falling is part and parcel of this learning curve: research shows that, on average, babies fall 17 times an hour when they’re learning to walk. “Give him a safe, soft space to lurch about in and then let him get on with this physical exploration,” says Karen. So slice open a pool noodle and wrap it around the edge of the coffee table, and pad any corners with pipe insulation. Stack cushions on the hearth and clear any clutter out of the way. 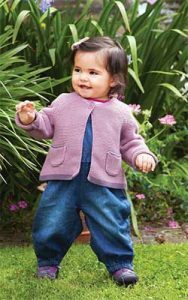 “Flat mats that play different notes as your baby walks over them are great at this stage for encouraging movement,” says Karen. 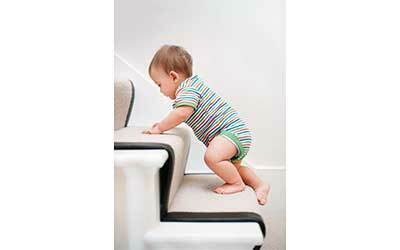 Babies love exploring them, and the lure of making sounds will motivate him to keep moving about. “Walking takes a lot of energy when you first start,” says Karen. “Your baby is exerting himself physically and he’s putting a lot of thought into what’s going on. So let him do it when he wants to—and let him stop when he wants to.” Researchers at New York University have found that when they’re first learning the ropes, babies will often walk one day, and then want a rest the next day and not walk at all. And even if he has only a few short bursts of activity, your youngster is still clocking up a lot of steps: on average, a toddler takes 2,368 steps an hour! This one’s so simple, but your youngster will really love playing it! 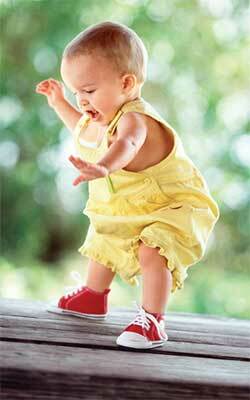 Gently roll a ball and encourage your baby to follow it. When the ball stops, he will naturally want to stop too to get the ball. Lay down a blanket, quilt and rug for your baby to walk over. He’ll need to work out how to alter how he’s walking on a surface that isn’t completely fl at, so he’ll probably stop and assess each different surface as he encounters it. Be his mirror and walk with him, and stop when he does. Then walk again—and stop—and you’ll soon find he copies you. All that practice makes perfect—eventually! “The more steps he takes, the more adept he’ll become,” says Karen. Quite how long it takes for him to be toddling without wobbling depends a lot on how much practice he gets, but usually around six months after he took his first steps, he’ll be walking with his feet closer together, his steps will become longer and more controlled and he’ll use his arms less for balance. “He’ll build his confidence, his co-ordination, his muscle strength and his sense of balance. And as he gets better at all these things, he’ll get further and fall less,” says Karen. Keep an eye on his feet, and you’ll notice his arches start to lift as he gets stronger too. But there’s still a lot left to learn, and your youngster will constantly challenge himself. He’ll carry things, work out how to pull a toy behind him, and to negotiate going up and down slopes, all without losing his balance. And all this means that he still needs plenty of time to potter about the house and the garden, so he can toddle up to the top of this wibbly-wobbly learning curve. Next stop, running! At this stage, walking in a variety of places lets him refine his hard-won skills. “Encountering different surfaces means your baby is learning how to use his body in different ways, using different muscles and becoming more flexible,” says Karen. “Soft-play centres are great, and take him walking in the park or in a sandpit.” Have a barefoot safari indoors and see how many different surfaces you can find. Dancing together is fun! Put on your favourite tracks and dance like a tree, a cat, an elephant, a train, a Teletubby… This will encourage your child to move his body in different ways, working different muscle groups and improving his balance.